Last month, Duraclean Services had the privilege of being part of a community luncheon sponsored by the Harford County Referral Partners Group. Held at 510 Johnny’s in the town of Belair, a variety of local business representatives were treated to an afternoon of delicious food, new business connections, and an eye opening look into some of the serious problems our county is facing at this present time. The luncheon started off with a short presentation by Darrell Mcdavid, the Executive Director for the Epicenter in Edgewood. Located in the heart of the town, the Epicenter offers a variety of programs to meet their community needs … Giving up to 7,000 pounds of food away weekly to those in need. Offering care stations for the homeless, complete with showering facilities set up to provide a safe, private, comfortable place to clean up, have a warm meal, and enjoy some friendly conversation in a welcoming atmosphere. Providing before and after school care, including snacks, help with homework, and a myriad of child friendly activities in a safe environment. Hosting special classes for those who were homeless, to help guide them as they get back on their feet, as well as Millenial classes set up for those “adulting” for the first time. Started by Mountain Christian Church over 5 years ago, the Epicenter has strived to be a safe place that empowers people, strengthens families, and builds community . . . and they have done just that, with far reaching effects throughout the county at large. It’s always good to know what is going on in our local towns, and it was great to hear about all of the good things going on in Edgewood through the Epicenter, if you’d like further information, you can reach out to The Epicenter at Edgewood Facebook Page. Our Main Speaker of the day was Sheriff Jeff Gahler. Recently re-elected for another term, he gave us a candid look into the Opioid Epidemic in Harford County, talking in depth of the far reaching affects that have filtered into our schools, our places of work, our families and our community as a whole. Highlighting new programs and reminding us of steadfast organizations that continue to work dillegently to educate, restore, and encourage those walking through this devastating epidemic. Programs like Hope House on wheels, touring around the county making parents aware of things to look for in a typical teenagers room to catch the signs of a drug problem, The Harford County Crisis Center offering 24 hours care to those in the county who find themselves in immediate need, the Substance Abuse Unit set up within the jail, making strides in educating those already incarcerated, and of course the Citizens Academy, set up to give those living in our county a better understanding of how they can help lend a hand within their own communities. Sheriff Gahler then opened up the floor to a Q & A session where luncheon attendees could ask questions and have an open conversation about the Opioid issue at hand. He offered an honest, informative, eye opening view of this terrible epidemic, but also focused on things put in place and new programs in the works to fight this war that is waging within our community. He did a wonderful job of balancing hard truths with glimmers of hope. I would love to tell you that one luncheon did a lot to make an immediate change in the Opioid Epidemic, but change always takes a while to be seen. However, what it did do, was bring 50 businesses within our county together to focus on one very important issue. To become more aware, educated and equipped to fight this devastating battle. To learn, to support, to volunteer, and to make a difference. Walking away informed at the seriousness of the situation, but also with a hope that if we all work together, that the future can be better for this community we all love so dearly. Thank you, Sheriff Gahler and to all of those striving to make a positive difference in the opioid epidemic. Although we have a long ways to go, we are moving in the right direction . . . together, and together is always the best place to be! Mother Theresa once said, “I alone cannot change the world, but I can cast a stone across the waters to create many ripples!” . . . May our community come together and work together to cast our stone far and deep, so that the ripples of awareness, education, restoration, compassion, and moving forward together in a positive way, are felt not only in our community, but in our county, our country, and throughout our world. Duraclean’s “Must Do” List to Prepare for Winter . . . Although the temperature has dropped dramatically over the last few days, we still have a little time before the bitter cold and snow head our way! Since it will be here before you know it, we’ve put together a list of “Must Do’s” to get your house in order before the first snowflake falls. So here it is, our Duraclean ” Must Do” List to Prepare for Winter. . .
Fireplaces . . . if you have a fireplace, you have a chimney, and if you have a chimney, you MUST make sure that it is fully cleaned EVERY season. Although there are some who attempt this feat on their own, we would highly suggest using a professional. Making sure that your flume is free and clear of any debris makes for a nice cozy fire and a sweet peace of mind knowing that your family is as safe as possible. While you’re at it, if you intend to have quite a few fires during the winter season, it’s best to order your fire wood in advance to ensure the very best price. Furnaces . . . this is an important one! Be sure to keep a watchful eye on your furnace, checking the blower often, and changing the filters regularly. Also routinely clean all vents and ducts. Using a professional is definitely the way to go with a furnace, but if you don’t be sure to keep up on regular maintenance. Gutters . . . As we already reminded you in our last blog, it’s very important to clean out your gutters. After filling with leaves, twigs and other debris during the Fall, clogged gutters WILL cause you problems, some of which can be quite costly! Always remember to guide all water AWAY from your house. Doing both of these things will help to protect you from water damage in or outside of your home! Sidewalks . . . Before the snow and the ice hit the ground, make sure to fill in or smooth out any cracks or crevices in your driveway, sidewalks or pathways. This may protect you from taking a “spill” and also make it much easier for you to shovel your way out during a snowstorm. Windows. . . When was the last time you replaced your windows, added some extra insulation or caulked around windows or doors? Doing each of these things can help lower your monthly heating costs. Winter Storm Kit . . .We’ve all been there, the snow starts falling, the winds start blowing and pretty soon we are left sitting in the dark; cold, hungry, cold, bored, and did I mention being cold? It’s good to always hope for the best, but be prepared for the worst! Gathering a few storage bins (depending on the size of your family) of bottled waters, a first aid kit, heavy blankets, socks, hats, gloves, sweatshirts, a few flashlights, canned and boxed food (a can opener of course), extra toilet paper, a hand crank radio, an extra battery for your cell phone and even a few packages of hand or foot warmers. I know it sounds like ALOT, but boy oh boy, when the electric is out and your sitting in the dark, cold and hungry, it’s so much easier to pull a pre-packed storage bin out of the hall closet, than it is to be frantically looking for items in the dark! Generator. . . If you’d like to avoid sitting in the dark for a day or two or more, a generator is a good investment. When used properly (outside use only!) it can totally change a terrible storm experience into a tolerable one. Offering a few lights, use of a space heater and the possibility of keeping the food in your refrigerator safe from any power outages. Although a pretty big investment, chances are you will probably use it at least a time or two, and when you do, you will be very glad that you have it! Although there will always be ways to tweak this “Must Do” list, we feel as though this is a great start to help prepare and make for an easier Winter season for you and your family. So take a few minutes now to make sure that you are prepared for later, and always remember, that if Disaster should strike, to give us a call @ 410-838-7330. Wishing you and your family a safe, happy, and stress free Winter Season! Well, it’s finally here! Just a few more days, and we will gather around dining room tables across America to give thanks for all we’ve been blessed with in the 2017 year. We will dine on delicious food made from family recipes handed down from one generation to the next, we will play games, catch up on conversation, do our best to carry on with old traditions and even incorporate some new ones. We will probably eat too much, shed a tear or two while reminiscing over past memories, and laugh til we cry as Uncle Roger tells the same joke for the hundredth time, but most of all we will enjoy spending an extra special day together with those who mean the most to us. Although some of us live in the same town where we will share a Thanksgiving meal with family and friends, there are many of us (51 million according to AAA) who will be traveling during this Thanksgiving season. One million are expected to hit the road from Maryland alone! If you are one of those families getting ready to travel hundreds of miles to spend time with those you hold dear, here is a quick check list to make things easier for you before you leave. DID YOU . . .
1. Turn off the water! If a pipe should burst while you are gone, you will come home to quite a mess! Basements, appliances, carpets and furniture can all be ruined in a matter minutes, so shut off the main water valve, flush your toilets and turn on your faucets to drain the pipes. Also, be sure to turn down the temperature on your water heater, no sense paying if there’s no one around to use it! 2. Turn down your thermostat! 55 degrees is the perfect setting (as long as no people or pets are in the house) things won’t freeze, and it will give your furnace and energy bill a break too! Well, everything except for a light or two on a timer to keep burglars away. Other than that, unplug it all; televisions, washer & dryers, extra lamps, toasters, and any other small kitchen appliances you have. Doing this will help lower your electrical usage, and also help to prevent fires while you are away. Remember, a penny saved, is a penny earned! 4. Let a neighbor (that you trust) know that you are headed out of town! Leave them a phone number to contact you in the event they see something “suspicious” or out of the ordinary. If you really (really) trust them, leave them a spare key in case you need someone to check on something while you’re away. 5. Be sure to lock all doors and windows! Burglars can still break into your home, but by all means, don’t make it easy for them! Nobody, I mean nobody wants to ride in a car (or on an airplane) with too much “stuff”. Take what you need, and maybe a little bit extra, but do your best to keep it light. You and everyone you are traveling with will be happy you did. Whether heading to the airport, or settling in for a 20 hour ride, early is the way to go. You hit less traffic, and use as much of your daylight as possible. 8. Make sure your cell phone is charged! No matter what you think, you ARE going to be using that phone. Whether being used for emergencies, for pleasure, or as a GPS to get to your final destination, phones are a giant necessity on a long road trip. So make sure it’s charged, and be sure to pack both a car and wall charger, you will be glad you did. 10. Have plenty of cash with you, as well as an extra credit card or two! Hopefully, your trip will go smoothly, but just in case it doesn’t, it’s always good to be prepared; hotels, rental cars, extra food, or even a surprise hospital visit are never free, so be sure to have plenty “just in case” $$$ with you. Comfy clothes, extra blankets and a fluffy pillow or two always make for a much more enjoyable trip. Even though you are about to embark on a long weekend of looking your very best, it’s definitely ok to “go casual” while you travel. Last, but certainly not least, have tons of fun. Whether you are off to the Bahamas for a secluded vacation or headed to see all of your extended family in North Carolina at Granny’s, be intentional to have meaningful conversations, and to make wonderful memories during this Thanksgiving season. Play touch football, watch parades, eat more, (this is the one time of year where it’s allowed and even encouraged!) laugh hard, and take it all in. Enjoy the season, and the beauty and wonder of it all . . . Don’t miss a single moment! Integrity- Doing the right thing, even when no one else is watching. Such a short and simple statement, but one that has been the primary foundation that Duraclean Services has built it’s reputation upon for 30 years and counting. Rick Criss, the owner, had a comfortable management position with a local supermarket chain in the 80’s, and although he liked the company he was working for, he was definitely looking for something more. He had heard about a franchise called Duraclean from a friend, and after looking into it, and going to a 10 day seminar, he decided to give it a try. Rick started off strictly as a carpet cleaning company, but with a lot of hard work and determination, soon he was servicing over 1,800 clients in the area (by word of mouth only, no marketing at that point.). As his clientele continued to grow, so did their needs, and soon he was learning about new, high level cleaning methods that would be beneficial for his customers and his community. With the help of his close friend Peter Carpenter, soon Water Mitigation, Water and Smoke Damage Restoration, and Mold Remediation became the newest services that Rick and his staff perfected. In 2006, Rick’s younger brother Tim came on board, and the Criss family continued to expand and grow Duraclean Services, bringing in the latest equipment, most experienced employees, even offering 24 hour emergency service to ensure a job well done every single time. From dealing with the effects of raging storms that pass through the Maryland area, to handling every day life situations (aka broken pipes and flooded basements ) to offering full reconstruction on those tough restoration jobs, air duct cleaning, and of course, the carpet cleaning that has been their “trademark” for so many years, Duraclean Services continues to put the customer first, helping people navigate through difficult circumstances, easing their burdens and always getting the job done! Through it all,the Criss brothers have made sure that the same integrity, quality, and high standards that Duraclean Services began with so many years ago, still continue on today. At the heart of things, Duraclean is a BIG business, able to tackle any job that comes their way (remember, No One is Faster to the Disaster!) . . . BUT at the same time, they make sure to keep that “small business” feel, always wanting to stay connected with their neighbors. 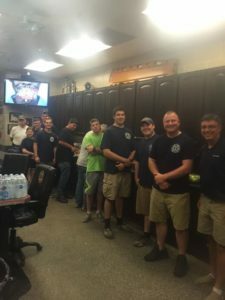 From hosting golf tournaments and bull roasts to benefit those in need, to partnering on special projects with non-profits such as Habitat for Humanity, to simply bringing lunch to their local Fire Department, Duraclean strives to connect with and support their community as much as possible. National Fire Prevention Month, the “Hot” topic of the week . . .
Did you know that the month of October has been declared National Fire Prevention Month? Over the course of 31 days, local Fire Departments all over our nation will focus extra attention on going to schools, fairs, churches, pancake breakfasts, parades and a host of community events to get the word out about Fire Safety, Early Detection, and Ultimate Prevention. Each year, millions of lives are affected by fires. The loss of homes and irreplaceable cherished “treasures” completely overwhelm families, and the devastating death of a loved one changes everything forever! Although there are times that we have absolutely no control over terrible situations that come our way, it is so important to be informed and aware that simple routines can be implemented to keep those we love as safe as possible. The act of checking fire alarms and changing batteries on a regular basis, placing fire extinguishers in strategic areas around your home, and practicing a family fire safety plan are just a few of the things you can do to ensure that you have protected your family to the best of your ability. When Fire Safety Programs such as “Stop, Drop, and Roll” and “Learn Not to Burn” are introduced to children at an early age and reiterated throughout childhood and the teenage years, they equip an entire generation with the knowledge and understanding of what emergency situations can occur, how best to prevent them, and the life saving steps to take when they arise. 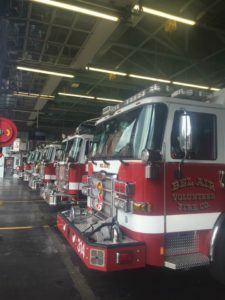 By supporting your local Fire Department and their mission to “get the word out”, you not only empower the youth in your area, but the entire community as well. -If a fire occurs in your home; Get Out, Stay Out, and Call for Help! Take the time to support your local Fire Department. Write them an encouraging note, say thank you when you see them out and about the community, treat them to lunch, or send a generous donation to keep their programs running strong. Remember, 24 hours a day, 7 days a week… they’ve got your back and are there to protect you and your family, no matter the cost…So do your best to support them any way that you can! Always remember in the event of fire or water damage, Duraclean is ALWAYS ready to go to provide your Mitigation, Remediation, and Restoration needs. Call anytime, day or night 410-838-7330. © 2019 Duraclean Services. All rights reserved.